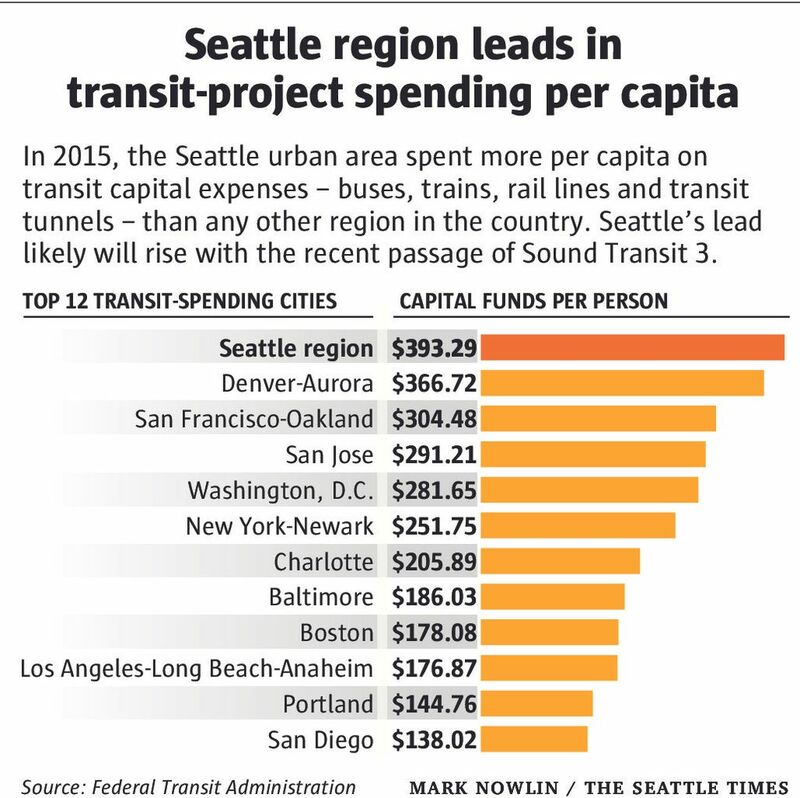 Even before the passage of Sound Transit 3, the Seattle area was spending more, per capita, on new transit projects than any city in the country, according to data compiled by the Federal Transit Administration. We take a look at why. Rewind to 2015. Before the uproar over increased car-tab fees. Before voters had approved $54 billion for 62 new miles of light rail and boosts to bus lines and commuter rail. 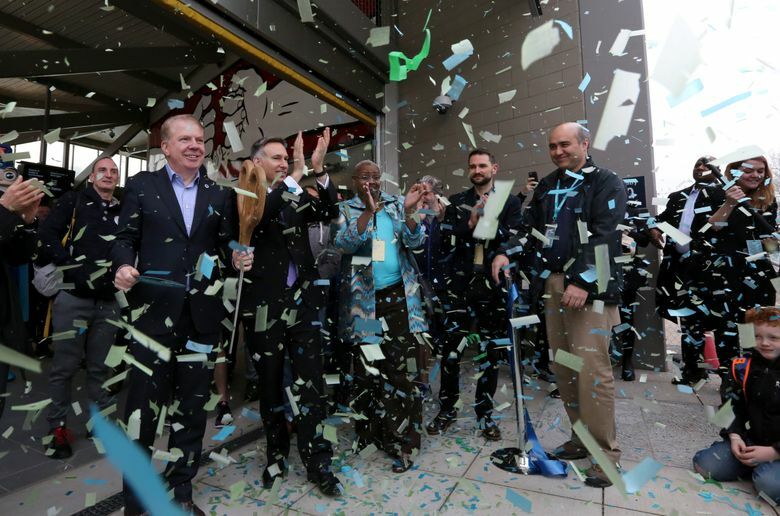 Before any Sound Transit 3 spending went into effect, the Seattle region was already spending more, per capita, on new buses, trains and other transit projects than any other major city in the country. For each person in the Seattle urban area, local transit agencies spent nearly $400 on capital expenses in 2015, the highest such figure in the country, according to data compiled by the Federal Transit Administration. Capital expenses only include money spent on new projects or equipment — things like new transit tunnels, rail lines, buses and rail cars — and not on operating expenses to run a transit system — things like salaries, gas and repair costs. The Seattle area’s capital spending on transit, a total of about $1.2 billion in 2015, includes revenue from both fares and taxes (it’s overwhelmingly taxes) and comes from 12 separate agencies, although the vast majority comes from just two: King County Metro and Sound Transit. It also includes federal, state and local money, although it’s mostly local money. Only two other urban areas came within $100 per person of Seattle’s spending on new transit — Denver, which, not coincidentally is in the late stages of completing its own light-rail project, and San Francisco-Oakland, which is dominated by hills and surrounded by water and is geographically similar to the Seattle area. 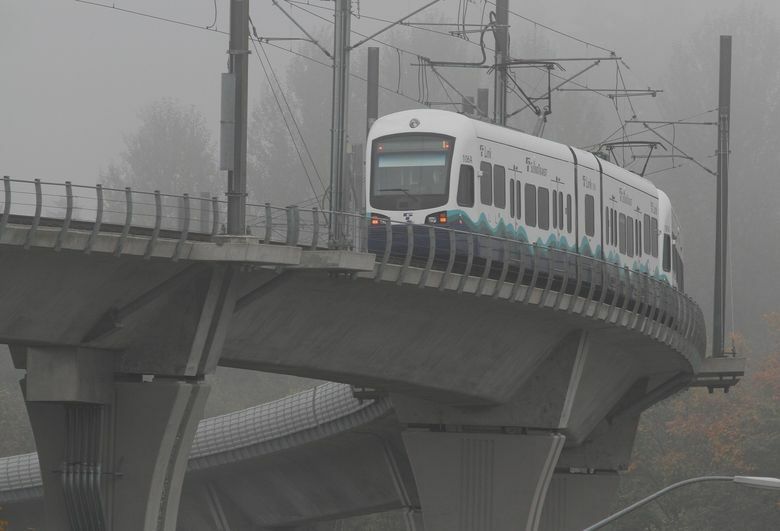 “If you want to build a rapid-transit line in a city like Seattle, that’s been around for a long time, it’s going to be expensive,” said Scott Rutherford, a transportation engineering professor at the University of Washington and the director of the university’s Sustainable Transportation Program. Seattle-area voters shot down major transit measures in 1968 and 1970. We’ve approved three in the last two decades. A big reason we’re spending so much on transit: We’re playing catch-up. The Federal Transit Administration (FTA) measures transit spending not by city, but by urban area. So the New York urban area, for instance, includes not just the city, but all of Long Island and much of northern New Jersey and southern Connecticut. The Seattle urban area, as defined by the Census Bureau, has a population of just over 3 million and stretches north to Everett, south to Tacoma and Joint Base Lewis-McChord and east to Sammamish and Enumclaw. It’s not a perfect match, but it looks a lot like Sound Transit’s taxing district. If you include operating expenses in the totals — the costs just to run a transit system and not build anything new — New York, with by far the nation’s largest and most-used transit system, spends the most per capita. Seattle comes in third. One caveat about the data: While the FTA has transit-spending numbers from 2015, the Census Bureau only has population data for urban areas from 2010. So for a region with a fast-growing population like Seattle’s, the amount of transit spending per capita is slightly inflated. Still, that likely wouldn’t affect the conclusion — that the area is spending the most on new transit projects. The closest region to Seattle in terms of new spending, Denver, is one of the few cities growing even faster than Seattle, so its per capita figure is inflated to a greater degree. And while Denver has completed about 100 miles of its planned 122-mile rail system, Seattle, with the passage of ST3, is just beginning another ramp-up in spending. It’s likely that once ST3 spending is factored in, the region’s spending on transit projects will rise from its 2015 rate of $393 per person to something closer to $500. Why does transit cost so much here? One reason, as Rutherford said, is that we’re just now building systems that other cities built decades ago. Another reason: Puget Sound. Spending by Washington State Ferries is included in Seattle’s total. That’s something that cities less interlaced with water don’t have to deal with. Denver’s light-rail system costs about $8?billion, a veritable pittance compared to the cost of Sound Transit’s light rail. Sound Transit, meanwhile, has been tunneling to Northgate. It tunneled under Capitol Hill to get to UW. And where it hasn’t tunneled, it’s often had to build elevated train lines. Hallenbeck’s very rough rule of thumb is that building an elevated train line multiplies the cost by 1.5, while building a tunnel triples it. David Gutman: 206-464-2926 or dgutman@seattletimes.com. On Twitter @davidlgutman. If you have any questions, tips or story ideas, please send them trafficlab@seattletimes.com.